Non stop adventure and death defying chases in Will Adam’s outstanding debut novel. It’s 318 BC in the deserts of Libya, and Alexander the Great is buried as only a God should be, placed in a Crystal Sarcophagus in a catacomb of chambers, each packed with diamonds, rubies and gold. This was how he should have remained, but time waits for no-one. 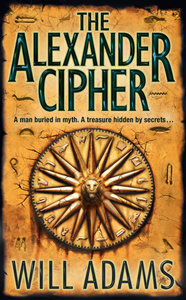 2007 and underwater archaeologist Daniel Knox has been on the trail of Alexander’s Gold ever since he can remember. When a tomb is uncovered on the construction site of a new hotel, Daniel believes he has found the clue to what he has been working towards for years. But the discovery has alerted two of the most dangerous men in the world, and Daniel is now a marked man. I’m always excited to discover a new author who writes historical fiction mystery-thrillers. In recent years, I’ve been disappointed by my forays, but Will Adams is definitely an author I will be watching. Alexander the Great? Check. Mystery? Check. Historical find? Check. Bad guys? Check. Hidden clues? Check. The Alexander Cipher has all the components of a great thriller in this genre (and something I’d like), along with a great premise. AND it delivers. After the first fifty or so pages, I didn’t want to stop reading it. I just wanted to find out what happens next and how all the pieces fit together. This novel balances a lot of story lines. Could some have been condensed? Probably. Did I mind? Not really. Even though there definitely was some unnecessary bits, it all fit together well and kept me turning the pages. Featured Poem: I’m Nobody! Who Are You?